Sweet sixteen! This is a major birthday and one that requires some thought when it comes to gift-giving. Get the lowdown on what to give the birthday girl or boy. There is no denying it. Sixteen-year-old girls are a tricky business. Their tastes change on a whim and to make it even harder; they are not always the most communicative members of the family. If you feel completely lost about what to give here are some quick ideas that will point you in a safe direction. Whether she is a girly girl or more or not, make up still plays a big part in how she likes to present herself. A few key items from her favourite range, or from a high-end department store brand will be much appreciated. If she does like strong colours there are several companies renowned for producing rich pigments. There are similarly brands, which encourage a more natural look. Do your research and find out what kind of look she wants to go for. Then all you have to do is book her an appointment at the chosen counter and let her experiment with her image. The cost of the makeover is normally redeemable against products so she gets to pick up some items at the end of her session. Clothes are also vital for a teenage girl. It is one way to express who she is and where she fits in. If you know her pretty well, feel free to embark on a shopping spree on her behalf, heading to her favourite stores, or the ones she aspires to visit. Be slightly cautious though - always make sure you keep the receipts in case you get the look wrong.If you don’t feel as confident about styling her, simply give vouchers or even just money, so that she can handpick the items. This is a low-risk option for the receiver and one that guarantees a smile and maybe even a few words of thanks! If you thought teenage girls were difficult to understand, then you might be in for a surprise when encountering a teenage boy. Shopping for them can sometimes seem impossible. It’s too young for driving lessons but too old for toy robots. Is there an in-between? Yes, there is – here are some failsafe options. Mp3 players, digital radios, LCD televisions or handheld video game consoles. These are dream gift ideas! They do come with dream price tags though so be warned if you promise one of these to the birthday boy. A cheaper idea is to get him a pay-as-you-go mobile. If he hasn’t got one already, this is a teenage essential and if he has, then a newer model will definitely be high on his agenda. Expect to pay anything up to £100 for a good mobile, throw in £10 worth of credit and he will be very impressed with his gift! Aftershave is key for a teenage boy. He might not have the money to splash out on designer brands, so receiving this, as a birthday gift will be a godsend. Check out some popular magazine titles before you shop to research the newest bottles on the market – that way you won’t risk buying something he already has in his collection. Turning sixteen marks the transition from boy to man so a grown up item of clothing is a good gift idea. Think well made, quality items that will stand the test of time. Branded shirts that he can wear on evenings out, classic shoes in rich leather or designer belts are winning gift ideas. Try and keep things fairly fashionable – if you don't then there is a chance that the item will never see the light of day. Err on the side of caution and go for popular brand names to avoid any disappointment. It might be that all of the above need not apply. If the birthday boy or girl is after a party, this will be their present. Sweet sixteen is rarely a low-key event these days and big party is becoming increasingly common. Think hired venues, caterers and professional entertainment. With the expense involved in organizing an event like this, you can pick up a few simple token gifts for them to open on the day. A book voucher, a beauty product or some costume jewellery to wear on the night - these are all simple and fun presents that do the job and make them smile. 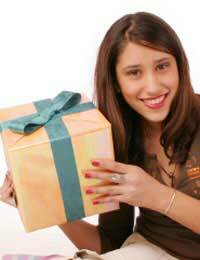 Jewellery, clothes, grooming products, gadgets or vouchers are all viable gift ideas. Play it safe – get what you know they will like. That way both you can breathe a sigh of relief, knowing that they will love what they are about to receive.